Downtown has some of the most exciting, luxurious, and fashionable living that Nashville has to offer. With all the things to do and places to be seen—not to mention the convenience of a short daily commute—life in downtown is where it’s at! The downtown area proper is bordered by Jefferson Street to the north, the Cumberland River to the east, and the semi-circle of The Loop (Interstates 24, 40, and 65 together) to the south and west. 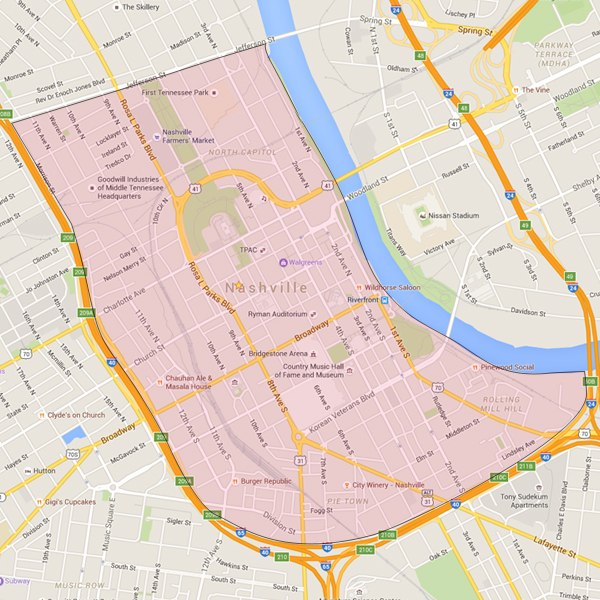 This area includes the Capitol, the business district, the Nashville Farmers Market, Lower Broadway, and the mixed use residential areas of Hope Gardens, Pie Town, The Gulch, and Rolling Mill Hill. One of the many benefits of living in Downtown is the abundance of transit options, including buses, shuttles, taxis, and the Music City Star. Only recently has Downtown begun to feature residential areas again; before 2000, the area was mostly devoted to business, government, and tourism. Yet these days, trendy high-rise condominiums and well-appointed residences abound, with new housing options being completed seemingly every month. Due to the exploding density and tourism industry in Nashville and especially Downtown, this area contains so many fine and independent dining options it’s nearly impossible to list them all. In terms of entertainment, Lower Broadway features Nashville’s world-famous honky-tonks like Tootsie’s, Legends, and the Wildhorse Saloon, and there are several other renowned places to see live music downtown, such as The Station Inn, 3rd & Lindsley, and 12th & Porter. This area is a popular choice for young, single professionals and successful business executives alike, and it’s the best place to live in Nashville if you want the front-row experience of the city’s signature events like the CMA Festival, Music City July 4th, Music City New Year’s Eve Bash, Live on the Green, Nashville Pride Festival, the Annual Nashville Christmas Parade, world-class sporting events (football, hockey, and baseball), and so much more!